Ifeel as if we are coming out of the “dark age of dieting” and people want an eating plan that is healthy, balanced and tailored to their personal needs. We all hear how important protein is for our daily diet and especially for those who lead athletic lifestyles, but you can actually get too much protein. But what happens if you’re not getting enough or enough of the right type of protein because you have chosen a restrictive vegetarian or vegan diet? How can you lead a vegetarian lifestyle and still get the valuable protein you need? For starters, let’s talk about why we need protein in the first place. The human body is made up of proteins and so many functions in the body are carried out by enzymes that are also made of the stuff. Proteins consist of amino acids that are used to make the body go! We can create some of these amino acids, but some of them we have to get directly from the protein in our food. Some of those protein sources that are meat-free don’t have all the amino acids we need – that’s where protein combining comes into play. It’s based on the idea that you can combine two meat-free protein sources and get all the amino acids your body needs. Sounds like a crazy chemistry experiment, but it’s as easy as peanut butter and jelly! Combining whole grain bread (protein source #1) with peanut butter (protein source #2) to make a complete protein. Not into PB and J? Never fear, here are some other ways to do it. Combine two different foods from these 3 catagories: whole grains, legumes, and nuts/seeds. Oh and mixing in eggs is always a sure bet. How about a scrambled egg with black bean salsa or veggie scrambled eggs with whole grain bread? Or if you’re vegan, what about brown rice with coconut and cashews? Variety is the key to any healthy diet. 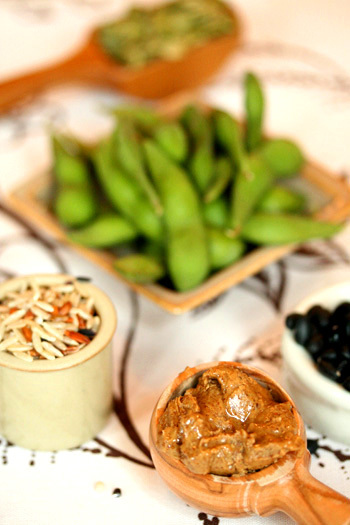 Mixing and matching your favorite healthy foods makes it interesting and delicious. My teenager is a vegetarian, what do I do ? Do you fear fat? Learn more about fats and controlling fat intake. Are carbs the culprit? Find out the difference between good and bad carbs and how much you should be eating. Want to learn more about nutrition in general? I recommend Joy Bauer’s, “Complete Idiot’s Guide to Total Nutrition” where I found my amino acid information for this blog.